Montegrappa Fortuna Blue Blazer writing instrument is created by torching the steel body and cap with fire. Forged in fire. That is the best description to fit the newest addition to Montegrappa’s incredible writing instrument series. This Italian writing instrument company was founded in 1912 and has regularly created writing instruments that capture the attention of writers and pen lovers. In fact, during World War II, famed author Ernest Hemingway spent time at Montegrappa and tested the pens while there. Over the past few decades, this is the brand that has brought us the Game of Thrones writing instrument and the Mule (based on the famed Moscow Mule cocktail). 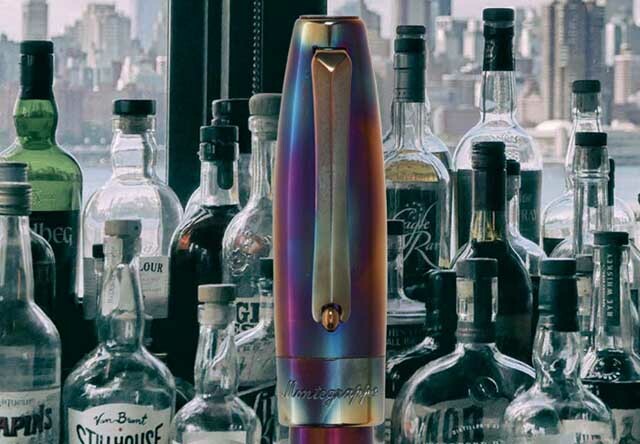 Now, the brand unveils the Blue Blazer writing instrument line that features stainless steel pens that are fire torched and burned until they achieve beautiful incandescent colors that range from blues to coppers and beyond. Montegrappa Fortuna Blue Blazer writing instrument is sold with a steel tankard used for making the fiery cocktail. The line is inspired by the Blue Blazer cocktail that is 155 years old and is considered to be the first fire-ignited drink. It is a mix of whiskey, hot water and powdered sugar that is made in one tankard and transferred several times back and forth between tankards before being served. However, before being transferred, the drink is lit on fire and that fire continues to burn right through to the pouring. I wouldn’t recommend trying to make this cocktail at home … it could have some prettty hot results. In fact, to make its Fortuna Blue Blazer writing instruments, Montegrappa puts the stainless steel body and clip under fire — using a torch to forge a unique pattern and hue for each and every pen. The Blue Blazer pens are offered as a fountain pen ($450), a rollerball ($425), and a ballpoint pen ($395), and in fine, medium or broad writing grades. 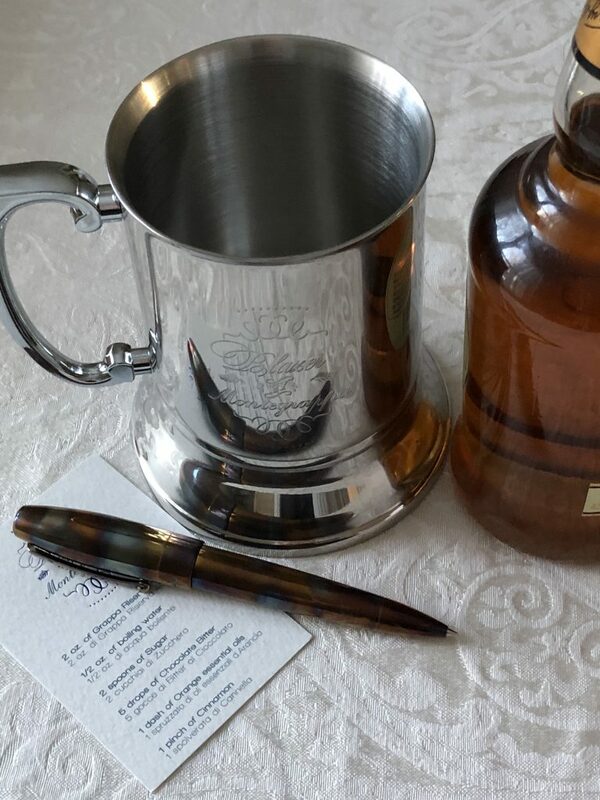 Additionally, a stainless steel Blazer tankard mug accompanies each pen. The brand even offers its exclusive Italian take on the Blue Blazer drink. Check out the video below to see how the fire cocktail is made and served (recipe at the end).